June was the Month of the Sacred Heart. And so it is fitting that this heroic virtue series would be about St. Margaret Mary Alacoque. Margaret was born in 1647 as the fifth of seven children to Claude and Philiberte Alacoque. Her father was a prosperous notary and her family owned farmland and had a home in the country. They also had aristocratic connections, as St. Margaret’s godmother was the Countess of Corcheval. She visited her godmother often until her death, and Margaret’s father died from pneumonia in 1655, when she was eight years old. This left Margaret’s mother a widow, with sole guardianship of her children, and so she was rarely home. Margaret received no formal education until she was eight and a half years old, when she went to a school led by the Urbanist Nuns. She made her first communion there at nine years of age. From this early age, her holiness and distaste for worldly things was very strong. Whenever her friends wished to play, she was never at peace until she went off on her own to pray. She admired the Nuns and wished to be holy like them. She saw them as saints and thought that if she were also a religious, she would become like them, and so her desire to enter into a religious vocation began to grown. Margaret fell very ill and was bedridden for four years shortly thereafter. In her desperation, she consecrated herself to the Blessed Mother, vowing that should she be healed, she would one day become one of Mary’s daughters. Margaret had barely finished making this vow when she was healed of her illness. After this healing, Margaret wished to enjoy her liberty, and became vain, but while seeking this life of pleasure, she felt her soul becoming more and more distant from God. During this time, some of her relatives came and took over running the household, and Margaret’s mother and brothers became like servants, everything being under lock and key and needing to ask permission for everything. Her oldest brother finally became old enough to run the property and Margaret’s family was in charge of her home once again. Margaret’s mother then fell very ill. During this time, Margaret felt strongly drawn to spend time with the Lord in mental prayer. He gave her the strength and guidance to care for her mother when she did not know how to. During this time Margaret’s mother also hoped that her daughter would marry, and Margaret was therefore sought in marriage. Margaret realized this as a great threat to the vow she made to the Blessed Virgin. Her love for her mother however, pushed her to consider evermore greatly the vocation of marriage, thinking that she made the vow without understanding it’s gravity. Margaret spent time considering it while she mortified herself during the time that she was undecided. She also began to convince herself that religious life would be too difficult for her. But this would soon change. Through prayer, Margaret eventually came to the decision, inspired by a vision, that she would in fact enter the convent. Margaret began to have a deep love for the evangelical councils of Poverty, Chastity, and Obedience, because, as said to her by our Blessed Lord, “by observing them, one becomes holy.” Margaret wanted to enter the religious life at all costs but still had 4-5 years to wait until she was old enough to enter. She desperately wished to learn how to love, and God inspired in her a deep love for the poor, and so in her time of waiting to enter the convent, she cared for the poor and taught them, giving to them all that she had. She worked to follow them in her state of life. She would not do anything without first asking permission of her superiors (even though it was not necessary that she always ask). Our Lord began to reveal to Margaret his will for her, in reproving her and in teaching her the way that she should go. Our Blessed Lord made clear to her how He cannot tolerate the slightest faults. He loves us and wants us to love Him back perfectly, as any lover would. He also confided His mother Mary to her, that she should fashion Margaret in the way that our Lord wills. Margaret nevertheless still struggled with being pressured to marry, wherein Satan tried to convince her that she would not be able to handle being a nun. Our Lord made clear to her once after receiving Holy Communion that “He was the most beautiful, the most powerful, the most accomplished amongst all lovers.” He did not want her to leave Him for another. Our Lord was jealous for her heart. Margaret felt a deep peace wash over her and she was 100% committed to be a religious after all, no matter what may come her way. Margaret was sent to live with her uncle, Philibert Lamyn, whose daughter was an Ursuline nun. Margaret was pressured by them to join the Ursulines, and the more she was pressured, the more she resisted. Our Lord revealed to her that He did not want her to be an Ursuline, but wanted her to join the Visitations at Les Sainte-Maries. She was discouraged to join them yet the more discouragement she received, the more she desired to join them. While with her Uncle, Margaret’s mother became ill and was close to death, and Margaret was glad to leave her Uncle’s and get away from the pressure she was receiving there. When she returned home, however, she encountered another type of discouragement. She was told that should she have stayed with her mother and immediate family, because if she had, her mother would not have fallen ill. While enduring this great mental suffering, Our Lord encouraged her to leave all and follow Him, conforming herself with his sufferings. She submitted to this and did much penance and prayer in reparation for outrages committed against Him. 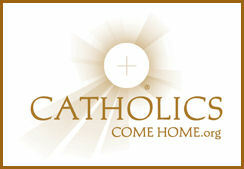 She desired Holy Communion greatly and could not wait to enter the convent so she would receive our Lord more often. Our Lord told her that the love of His Sacred Heart must spread and manifest itself to men, and He would reveal its graces through her. This began a series of revelations, which occurred over a period of 18 months. Margaret Mary went to Mother de Saumaise, the Superior of the Order, with the account of her mystical experiences. 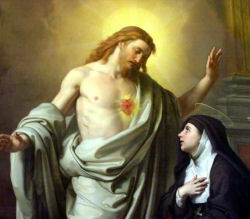 Margaret Mary told her that she had been chosen as the transmitter of a new devotion to the Sacred Heart. Mother Superior reprimanded her for her presumption. Shortly thereafter, Margaret Mary collapsed, and became deathly ill. Mother Superior thought that she might have erred in scorning Margaret Mary’s story, and vowed that should her life be spared, it would be a sign that the visions and messages were truly from God. Margaret Mary recovered, and Mother de Saumaise sent an invitation to some Priests who were in the town to hear her story. They listened to Margaret Mary’s story and came to the conclusion that she was delusional. Their examination was complete torture to Margaret Mary. 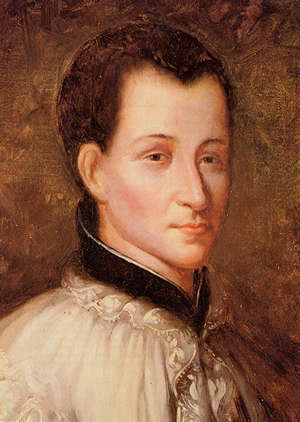 Later, Father Claude de la Columbiere, who was a Jesuit, talked with her about her visions. He was entirely convinced that her revelations were genuine. Father Claude wrote about the Margaret Mary and inaugurated the devotion to the Sacred Heart in England. For many years following this, Margaret Mary was plunged into a spiritual desert, suffering from despair, self-inflicted punishments, and from the attitudes of those around her. Though she may have been in what the great Doctor of the Church,St. John of the Cross calls a “Dark Night of the Senses”, she continued to receive more revelations and spiritual gifts from Our Blessed Lord. Father Claude returned to the convent in 1681 and died there in 1682. Margaret Mary was appointed to the position of assistant and novice-mistress by her new Mother Superior. Opposition to her within her convent ended-or at least lessened-after an account of Margaret Mary’s visions was read in the refectory from some of Fr. Claude’s writings. The devotion to the Sacred Heart was practiced at this time, but it regained it’s strength through the writings of Father Claude and through the work of Father John Eudes. The devotion first gained popularity in France, followed by Poland and other countries. On June 15th, we celebrate the Feast of the Sacred Heart of Jesus, followed by the Feast of the Immaculate Heart of Mary. 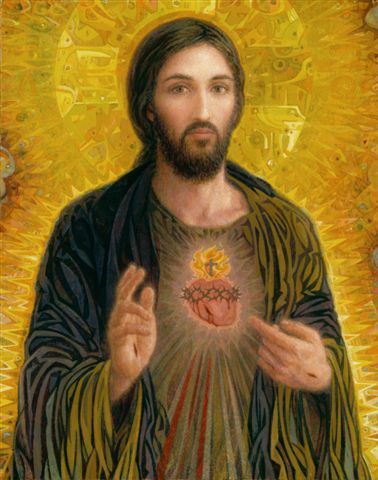 Please visit this page for prayers and devotions to the Sacred Heart. 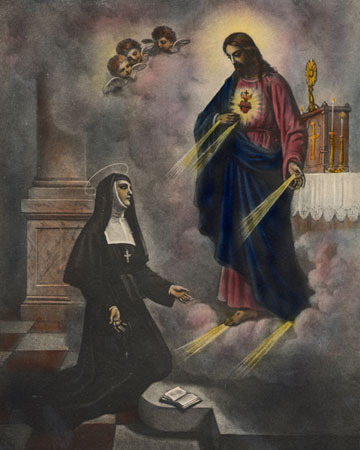 Please visit this page for prayers and devotions to St. Margaret Mary Alacoque.